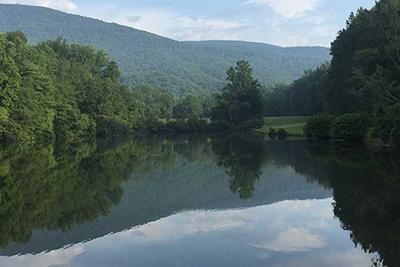 Property at Wintergreen Resort includes multiple small ponds ranging in size from 2-5 acres. These ponds are located throughout the property and provide excellent aesthetic additions to the neighborhoods and homes in the Stony Creek Subdivision. Ponds capture run-off from nearby Crawford’s Knob and release through various streams into the South Fork of Rockfish River. These ponds provide water quality benefits along with boating and fishing opportunities for WPOA (Wintergreen Property Owners Association). Current work involves overall water quality assessment of the ponds, including profiles of key chemical constituents, fish population estimates, and algal and zooplankton productivity. These measures provide baseline conditions used to develop management plans for the ponds.